This is a staple in our house. It’s it versatile, easy to make, delicious and uber-healthy! A great way to start the day. You can substitute the ingredients I’ve used here of course but we’ve found that you need a juice base (pineapple, apple, orange etc), then a bunch of whole-fruits (banana, frozen berries, mango, clementine and so on). If you would like a FREE COPY OF THE RECIPE E-BOOK, and haven’t yet signed up to Plantified, please sign up here: http://opensaucevegan.com/register/ and you will receive your FREE recipe book once it is released. Cut the peel off the pineapple. Cut it into pieces that fit into the juicer. Put a quarter of it into the blender jug. Juice the remaining pineapple and also add to the blender jug. 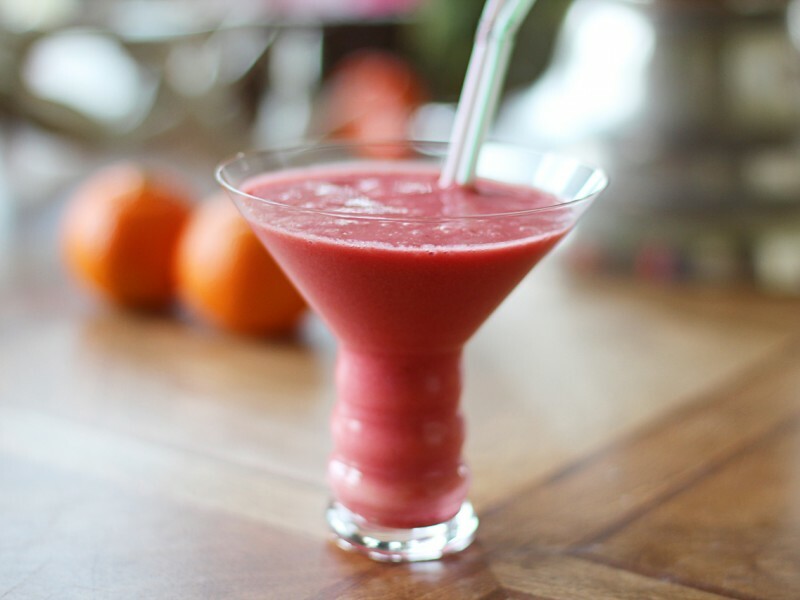 Add the peeled bananas, clementines, the berries and the ice and blend until totally smooth.